It is worth mentioning that the following steps were tested on Ubuntu 16.04. Caffe's root installation directory contains a file called Makefile.config.example which is a template for Makefile.config file, the one which we're going to create by copying Makefile.config.example and then editing it. Caffe can work in CPU and GPU mode. CUDA is a requirement for GPU mode so we can skip this step if we'll be running Caffe only in CPU mode. I described here how to install CUDA on Ubuntu. In CPU mode, Caffe can use ATLAS, MKL or OpenBLAS. In GPU mode, Caffe can use cuBLAS. 0 to upgrade, 3 to newly install, 0 to remove and 63 not to upgrade. Need to get 6,315 kB of archives. After this operation, 42.1 MB of additional disk space will be used. Selecting previously unselected package libatlas3-base. Selecting previously unselected package libatlas-dev. Selecting previously unselected package libatlas-base-dev. Boost is a set of C++ libraries which extend C++ language and contain helper routines for various applications. 0 to upgrade, 97 to newly install, 0 to remove and 63 not to upgrade. Need to get 53.9 MB of archives. After this operation, 273 MB of additional disk space will be used. Selecting previously unselected package libboost1.58-dev:amd64. Selecting previously unselected package libboost-dev:amd64. Selecting previously unselected package libboost1.58-tools-dev. Selecting previously unselected package libboost-tools-dev. Selecting previously unselected package libboost-atomic1.58.0:amd64. Selecting previously unselected package libboost-atomic1.58-dev:amd64. Selecting previously unselected package libboost-atomic-dev:amd64. Selecting previously unselected package libboost-chrono1.58.0:amd64. Selecting previously unselected package libboost-chrono1.58-dev:amd64. Selecting previously unselected package libboost-chrono-dev:amd64. Selecting previously unselected package libboost-thread1.58.0:amd64. Selecting previously unselected package libboost-context1.58.0:amd64. Selecting previously unselected package libboost-context1.58-dev:amd64. Selecting previously unselected package libboost-context-dev:amd64. Selecting previously unselected package libboost-coroutine1.58.0:amd64. Selecting previously unselected package libboost-coroutine1.58-dev:amd64. Selecting previously unselected package libboost-coroutine-dev:amd64. Selecting previously unselected package libboost-serialization1.58.0:amd64. Selecting previously unselected package libboost-serialization1.58-dev:amd64. Selecting previously unselected package libboost-date-time1.58-dev:amd64. Selecting previously unselected package libboost-date-time-dev:amd64. Selecting previously unselected package libboost-exception1.58-dev:amd64. Selecting previously unselected package libboost-exception-dev:amd64. Selecting previously unselected package libboost-system1.58-dev:amd64. Selecting previously unselected package libboost-filesystem1.58-dev:amd64. Selecting previously unselected package libboost-filesystem-dev:amd64. Selecting previously unselected package libboost-regex1.58.0:amd64. Selecting previously unselected package libboost-graph1.58.0:amd64. Selecting previously unselected package libboost-test1.58.0:amd64. Selecting previously unselected package libboost-test1.58-dev:amd64. Selecting previously unselected package libboost-graph1.58-dev:amd64. Selecting previously unselected package libboost-graph-dev:amd64. Selecting previously unselected package libopenmpi1.10. Selecting previously unselected package libboost-mpi1.58.0. Selecting previously unselected package libboost-graph-parallel1.58.0. Selecting previously unselected package libboost-graph-parallel1.58-dev. Selecting previously unselected package libboost-graph-parallel-dev. Selecting previously unselected package libicu-dev:amd64. Selecting previously unselected package libboost-regex1.58-dev:amd64. Selecting previously unselected package libboost-iostreams1.58-dev:amd64. Selecting previously unselected package libboost-iostreams-dev:amd64. Selecting previously unselected package libboost-locale1.58.0:amd64. Selecting previously unselected package libboost-locale1.58-dev:amd64. Selecting previously unselected package libboost-locale-dev:amd64. Selecting previously unselected package libboost-log1.58.0. Selecting previously unselected package libboost-thread1.58-dev:amd64. Selecting previously unselected package libboost-log1.58-dev. Selecting previously unselected package libboost-log-dev. Selecting previously unselected package libboost-math1.58.0:amd64. Selecting previously unselected package libboost-math1.58-dev:amd64. Selecting previously unselected package libboost-math-dev:amd64. Selecting previously unselected package libibverbs-dev. Selecting previously unselected package libnuma-dev:amd64. Selecting previously unselected package libhwloc-dev:amd64. Selecting previously unselected package libopenmpi-dev. Selecting previously unselected package mpi-default-dev. Selecting previously unselected package libboost-mpi1.58-dev. Selecting previously unselected package libboost-mpi-dev. Selecting previously unselected package libboost-python1.58.0. Selecting previously unselected package libboost-mpi-python1.58.0. Selecting previously unselected package libboost-mpi-python1.58-dev. Selecting previously unselected package libboost-mpi-python-dev. Selecting previously unselected package libboost-program-options1.58.0:amd64. Selecting previously unselected package libboost-program-options1.58-dev:amd64. Selecting previously unselected package libboost-program-options-dev:amd64. Selecting previously unselected package libexpat1-dev:amd64. Selecting previously unselected package libpython2.7-dev:amd64. Selecting previously unselected package libpython-dev:amd64. Selecting previously unselected package python2.7-dev. Selecting previously unselected package python-dev. Selecting previously unselected package libboost-python1.58-dev. Selecting previously unselected package libboost-python-dev. Selecting previously unselected package libboost-random1.58.0:amd64. Selecting previously unselected package libboost-random1.58-dev:amd64. Selecting previously unselected package libboost-random-dev:amd64. Selecting previously unselected package libboost-regex-dev:amd64. Selecting previously unselected package libboost-serialization-dev:amd64. Selecting previously unselected package libboost-signals1.58.0:amd64. Selecting previously unselected package libboost-signals1.58-dev:amd64. Selecting previously unselected package libboost-signals-dev:amd64. Selecting previously unselected package libboost-system-dev:amd64. Selecting previously unselected package libboost-test-dev:amd64. Selecting previously unselected package libboost-thread-dev:amd64. Selecting previously unselected package libboost-timer1.58.0:amd64. Selecting previously unselected package libboost-timer1.58-dev:amd64. Selecting previously unselected package libboost-timer-dev:amd64. Selecting previously unselected package libboost-wave1.58.0:amd64. Selecting previously unselected package libboost-wave1.58-dev:amd64. Selecting previously unselected package libboost-wave-dev:amd64. Selecting previously unselected package libboost-all-dev. 0 to upgrade, 1 to newly install, 0 to remove and 63 not to upgrade. Need to get 473 kB of archives. After this operation, 3,811 kB of additional disk space will be used. Selecting previously unselected package libprotobuf-dev:amd64. 0 to upgrade, 2 to newly install, 0 to remove and 63 not to upgrade. Need to get 293 kB of archives. After this operation, 1,129 kB of additional disk space will be used. Selecting previously unselected package libprotoc9v5:amd64. Selecting previously unselected package protobuf-compiler. 0 to upgrade, 4 to newly install, 0 to remove and 63 not to upgrade. Need to get 240 kB of archives. After this operation, 1,340 kB of additional disk space will be used. Selecting previously unselected package libgflags2v5. Selecting previously unselected package libgflags-dev. Selecting previously unselected package libgoogle-glog0v5. Selecting previously unselected package libgoogle-glog-dev. libgflags-dev is already the newest version (2.1.2-3). libgflags-dev set to manually installed. 0 to upgrade, 0 to newly install, 0 to remove and 63 not to upgrade. HDF5 is a data storage model for storing large amounts of data. 0 to upgrade, 5 to newly install, 0 to remove and 63 not to upgrade. Need to get 5,139 kB of archives. After this operation, 31.2 MB of additional disk space will be used. Selecting previously unselected package hdf5-helpers. Selecting previously unselected package libhdf5-cpp-11:amd64. Selecting previously unselected package libaec-dev:amd64. Selecting previously unselected package libhdf5-dev. Selecting previously unselected package libhdf5-serial-dev. LMDB (Lightning Memory-mapped Database) is a key-value based database with high performance. 0 to upgrade, 3 to newly install, 0 to remove and 61 not to upgrade. Need to get 354 kB of archives. After this operation, 2,607 kB of additional disk space will be used. Selecting previously unselected package liblmdb0:amd64. Selecting previously unselected package liblmdb-dev:amd64. Selecting previously unselected package lmdb-doc. LevelDB is Google's light DB based on key-value storage. Need to get 307 kB of archives. After this operation, 1,333 kB of additional disk space will be used. Selecting previously unselected package libleveldb1v5:amd64. Selecting previously unselected package libleveldb-dev:amd64. Need to get 24.0 kB of archives. After this operation, 127 kB of additional disk space will be used. Selecting previously unselected package libsnappy-dev:amd64. cuDNN is NVIDIA's CUDA library for Machine Learning. In order to be able to download cuDNN, you have to become a member of NVIDIA's Accelerated Computing Developer Program. Membership is free, you just have to fill the questionnaire. 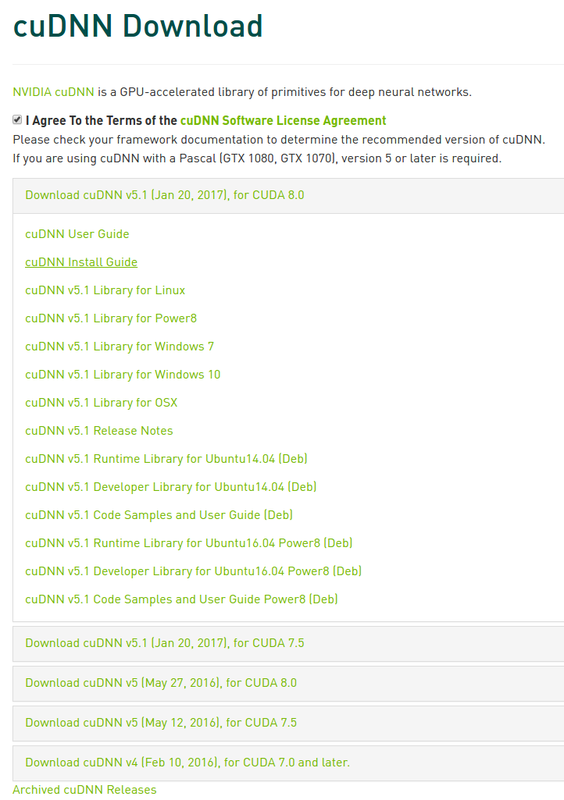 From the cuDNN download page, we're going to download cuDNN v5.1 Library for Linux which comes as cudnn-8.0-linux-x64-v5.1.tgz file (~100.5MB). Caffe officially supports Make and we're going to use this build system. We can speed up compilation process by using make's -j option with value 8. It tells make to perform 8 jobs in parallel. Fix for this error is explained here. nvcc warning : The 'compute_20', 'sm_20', and 'sm_21' architectures are deprecated, and may be removed in a future release (Use -Wno-deprecated-gpu-targets to suppress warning). Note: Randomizing tests' orders with a seed of 94463 . [==========] Running 2085 tests from 277 test cases.